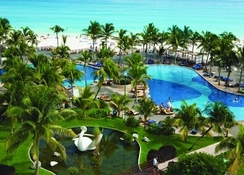 The Grand Oasis Palm Resort in Cancun is a luxury all inclusive hotel planted on the fine, white sands of the Hotel Zone. If you ever get bored of the beach, this family-friendly property is just 8km from lively Downtown Cancun where you'll find a line up of shops, restaurants, bars and entertainment. 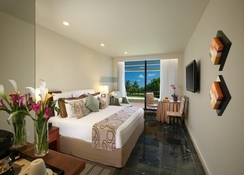 Grand Oasis Palm boasts well-furnished rooms complete with modern decor and amazing sea views, and the hotel's six gastronomic offerings are equally spectacular, with quality restaurants serving a fushion of local and International cuisines. The all inlclusive facilities mean guests can enjoy three splash-tastic swimming pools (including one for the little ones), a Kiddo Zone, a gym, sports and leisure facilities, a beach club, Sensoria Spa, in-house entertainment and more. Golf enthusiasts can also tee off at the 18-hole Cancún Golf Club at Pok-Ta-Pok, about 6.3km from the hotel. The hotel has an array of activities and leisure options, both indoors and outdoors. 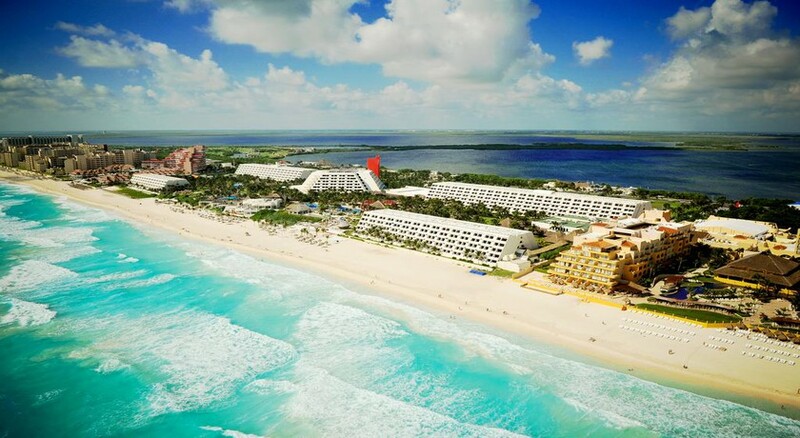 Located on a private beach in Cancun’s popular Hotel Zone, Grand Oasis Palm is close to the resorts top tourist attractions – plus is just 8km from the bustling Downtown Cancun. The hotel is close to a golf course and just a 5-minute walk from the Museum of Popular Mexican Art and Escenica Tower. Linda Beach and Langosta Beach are also within 15 minutes from the property. Guests can take a fun-filled boat trip to the nearby island of Isla Mujres and even further away to the Mayan ruins of Chichen Itza or Tulum. 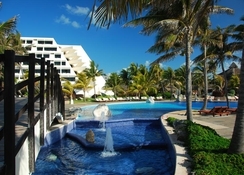 The Cancun International Airport is about 21km from the hotel. The 594 rooms in Grand Oasis Palm Resort are well-furnished with modern décor and feature a host of sophisticated guest amenities. The spacious rooms come with two double or king size beds, en-suite bathrooms with shower, hairdryer and toiletries, flat-screen cable TV, an alarm clock, a minibar and coffee maker. 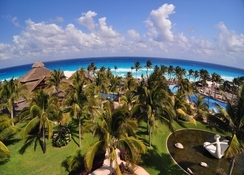 Offering views of the pool or lagoon, the rooms come in categories of Ocean View and Standard. The Oasis Palm Resort has six exclusive restaurants dishing up a selection of cuisines from Mexican to Asian, Italian and International. Guests can choose from the Las Palmas buffet-style restaurant, Careyes Gourmet dining venue, Maki Tako's Japanese fusion restaurant, The White Box for Mediterranean flavours, and Sian Ka'an Beach Club for light snacks on the sand. In addition, the Kiddo Zone boasts its own mini kids-only restaurant serving up fun-loving food the little ones will love. Guests also get access to the restaurants and bars at the sister hotel Oasis Palm Beach next door. The Oasis Palm Resort has an amazing array of relaxation and recreational services. Guests can bask in the warm Caribbean sun on the private beach or take a dip in its lovely pool. The hotel has a large, well-kept garden too that's fit for a leisurely stroll. Kids can have fun in the pool with water slides or head to the kid’s club, available – complete with its own mini restaurant. There are tennis and squash courts and a gym for fitness and sports enthusiasts, while golf lovers can head to the nearby 18-hole golf course. The hotel also hosts entertainment shows at night. Awesome but busy at times, got upgraded on arrival to sea front which was out of the world, food OK but loads of choice anyway, beach is amazing, cancun town is nice too.